Albert Castrucci, 83, of Woodland Park, passed away peacefully in his home surrounded by his family, on January 27, 2019. Al was born in Paterson on May 12, 1935 to the late Nicola and Katherine (Perona) Castrucci. He proudly served in the United States Navy Reserves from 1953 to 1961. He worked for 22 years at General Electric in Fair Lawn and later began his own kitchen and bathroom remodeling business. He was a masterful carpenter who was a member of the National Kitchen and Bath Association. Anyone that knew Al, will always remember him as a devoted member of the West Paterson Fire Company #2 located on McBride Avenue. 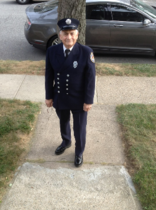 He volunteered for the department for 56 years, serving as Captain for 22 of those years. He was a honorable hero and his dedication to the department will always be remembered and appreciated. Albert was the beloved husband of Patricia (Cerbie) Castrucci for 37 years. He was the adored father of Cathy Dwyer and her husband Michael, Angela De Lotto and her husband David, and Lisa Castrucci and her fiance Steve Malloy and the dear step father to Edward Gualtieri and his partner Fernando Salas and to Thomas Gualtieri. Al was cherished grandfather of Andrea De Lotto and her husband Jude Pascarelli, Garrett De Lotto and Nicholas De Lotto and the great grandfather of Mia Pascarelli. He is also survived by his brother Edwin Castrucci and his wife Trish and his sister Elaine Gacek as well as many nieces and nephews. Visitation will be Wednesday from 2-4 & 7-9pm at Santangelo Funeral Home, 635 McBride Ave., Woodland Park. A funeral Mass will be offered on Thursday at 9:30am at St. James of the Marches Church, 410 Totowa Rd., Totowa, NJ. Guests may arrive at Santangelo Funeral Home at 8:30am. Entombment will follow at Holy Sepulchre Cemetery in Totowa. Assistant Chief Ficarra, who was elected on Monday, January 14, 2019 to fill the unexpired term of Assistant Chief Joseph A. Macones. We wish you nothing but the best as our new Assistant Chief, and we cant wait to start working with you and learning from you. The WPFD thanks and acknowledges Assistant Chief Joe Macones Jr for 26 years of dedicated service to the Fire Department and Borough of Woodland Park. Joe has been serving as an Assistant Chief for 18 of those years. The Department is sad to announce that Joe will be stepping down as a Chief effective January 1, 2019. Joe has had a huge impact on the Department over his years with us. He is our department Training Officer, holding various drills and lectures to help every member to be the best firefighter he or she can be. He is also a dedicated participant of all the functions the department holds. Joe's boots will be hard to fill and he will be greatly missed!